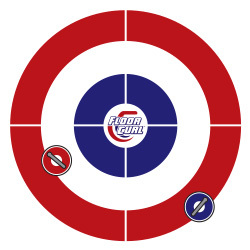 Floor Curling is a modified version of the Olympic sport of curling with one major difference – no ice! 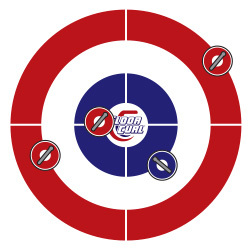 Place your two target mats with the rings (the “house” in curling) approximately 8 meters (26 feet) apart. Each mat should be slightly offset from the other to avoid standing on the mats when delivering the stones. Note the distance between mats can easily be adjusted to suit your group’s preferences. Stones should be delivered from floor level by hand, or via the use of a Pusher Stick for participants that cannot, or prefer not, to bend to floor level. Teams determine who has “Hammer” (or last rock) in the opening ”end”, usually by way of a coin toss. Having the last rock is considered an advantage. Stones are delivered in an alternating manner. Red, blue, red, blue, or vice versa, until all 8 stones are played. Once all eight (8) stones are played an “end” is completed and scoring is tabulated (see below). 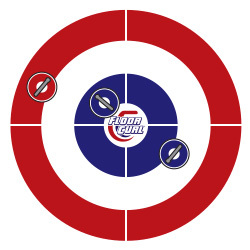 Typically a Floor Curling game consists of eight (8) ends but this can also be adjusted to suit your group. The object of the game is to score more total points than the opponent over the course of the match. At the completion of each end, a team scores one point for each stone that is closer to the “button” (centre of the rings) than the closest stone to the “button” of the opposing team. Only stones that are in, or touching the rings (when viewed from overhead), are eligible to score. Only one team can score in any given end. Here are some sample scoring scenarios (see Figures 2, 3, 4). Prior to playing, ensure the surface is as clean as possible. A dry mop of the surface prior to use is highly recommended. Do not get the bearings wet as they can rust. Ensure that the playing surface is both clean and dry. This will prevent dirt and dust from gathering in the bearings and will prolong their life. Download our Official Scorecard and keep score of your game!